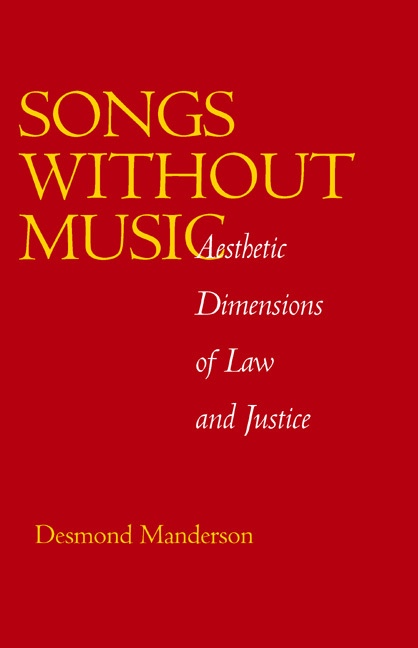 In this pathbreaking and provocative analysis of the aesthetics of law, the historian, legal theorist, and musician Desmond Manderson argues that by treating a text, legal or otherwise, as if it were merely a sequence of logical propositions, readers miss its formal and symbolic meanings. Creatively using music as a model, he demonstrates that law is not a sterile, rational structure, but a cultural form to be valued and enhanced through rhetoric and metaphors, form, images, and symbols. To further develop this argument, the book is divided into chapters, each of which is based on a different musical form. Law, for Manderson, should strive for neither coherence nor integrity. Rather, it is imperfectly realized, constantly reinterpreted, and always in flux. 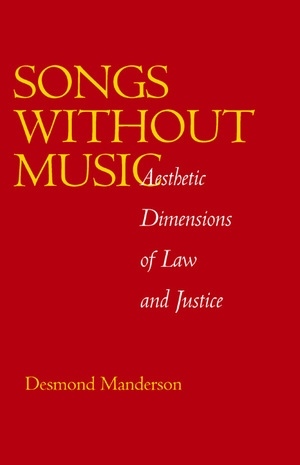 Songs without Music is written in an original, engaging, and often humorous style, and exhibits a deep knowledge of both law and music. It successfully traverses several disciplines and builds an original and persuasive argument for a legal aesthetic. The book will appeal to a broad readership in law, political theory, literary criticism, and cultural studies. Desmond Manderson is Senior Lecturer and Director of the Julius Stone Institute for Jurisprudence in the Faculty of Law at the University of Sydney, Australia.